Dry hopping is a great way to enhance the hoppy aroma and flavor of your beer. I previously wrote an article on dry hopping covering the basic technique, but this week will go into more depth on some options and recent trends in dry hopping. The main purpose of dry hopping is to transfer fragile hop aroma oils to your beer to get a strong hop aroma in certain styles. Key aroma oils in hops are volatile, which means they boil at a relatively low temperature. Because of this, these hop oils are lost if boiled, so brewers use a combination of steeping/whirlpool hops post boil, and dry hopping to capture these great aroma oils in their beer. The basic dry hop technique is to add hops post fermentation. However, there are a large number of variations on dry hopping that center on varying when the hops are added, type, temperature, and also the contact time. I’ll start with the issue of contact time. Not long ago it was thought that maximizing contact time was best, so brewers often added hops for the entire secondary or even added hops to a keg (keg hopping) and left them in place for weeks. Unfortunately too much hop contact can lead to a “grassy” flavor and the transfer of certain vegetal flavors – so the trend now is towards shorter contact times. If dry hopping too long is bad, how short can we go? Not surprisingly, commercial brewers who are concerned about time and money have been pushing the limits. Recent research indicates you may be able to get good dry hopping aroma and flavor with as little as 24 hours of contact time, though I prefer a longer exposure of 48-72 hours (2-3 days). Using a hop bag in the fermenter lets you remove the hops when done. Which hops work best for dry hopping? There is consensus that pellet hops are the best choice for dry hopping. Pellet hops are pulverized before being molded into pellets which maximizes the area exposed to your beer and also helps break down the cell structure of the hops. This helps expose and transfer the fragile hop oils into your beer. The variety of hop to use is an individual choice. Some prefer only using low alpha, aroma hops while others are experimenting with high alpha hops. I prefer varieties that have good “dry aroma” – i.e. a good aroma and flavor when I rub the hops in my hands and taste the raw hops. Where possible, I try to match these with the flavor of the beer I’m brewing. Another consideration when choosing hop varieties is to pick those with good aroma oil profiles. The four aroma oils described here play a major role in adding hop aroma and flavor post boil, so you can look at the hop composition in those major oil categories to help select your dry hop variety. At what temperature should you dry hop? Again there is good agreement that warmer temperatures work best. The fragile hop aroma oils simply are not as soluble at low temperature. This is not to say you want to heat your finished beer, but merely that dry hopping should be done before you cold crash your beer – usually at your normal fermentation temperature. Next week we’ll take a look at when to add the dry hops. Surprisingly there are quite a few variations here – each of which will result in slightly different effects in the finished beer. Thanks for joining me on the BeerSmith Home Brewing Blog. Please sign up for the newsletter or subscribe to my podcast for more beer brewing goodness. I’m not convinced a few days of contact time is long enough when it comes to dry-hopping. 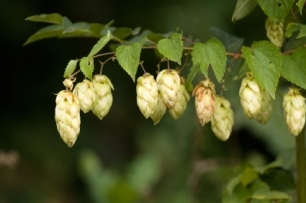 The industry is now talking about glycosides from hops, which are aroma-sugar molecules. Yeast can and do metabolize the glucose portion of glycosides releasing the aroma portion of the molecule. Metabolizing glycosides takes a lot longer than 2-3 days, I read a paper where a fellow said it took 30 days. I normally dry hop for 10 days but recently tried 21 days and the beer tasted incredibly smooth compared to previous IPA’s I’ve brewed in the past. I brewed for 50 IBU’s and dry-hopped with 35 grams of Cascade with ~ 5.5 gallons of beer. Dry Hopping for Beer Revisited – Part 2 of 2 | Drinking Beer Inc!